Any thoughts? My boat needs new stringers. I use yellow pine, NO knots. I believe thats what the factorys used back in the day. I use clear Douglas Fir, soaked with acetone-thinned polyester resin after all cuts are made. Chris, Most boat manufactures used what was close, cheap, and available. Glasspar used Douglas Fir in their boats. Some manufactures used Clear SPF (spruce, pine, fir), Clear White Oak, Clear Yellow pine, and cedars are widely used in the industry. Wood is but structural support filler the real strength is in the fiberglass. That said wood is necessary as long sections of fiberglass with out a structural filler aka support will twist, oil can, distort, and crack. There is as much debate as to which wood is best. I use Clear fir because it is close to the Douglas fir Glasspar used. Why is the transom first? 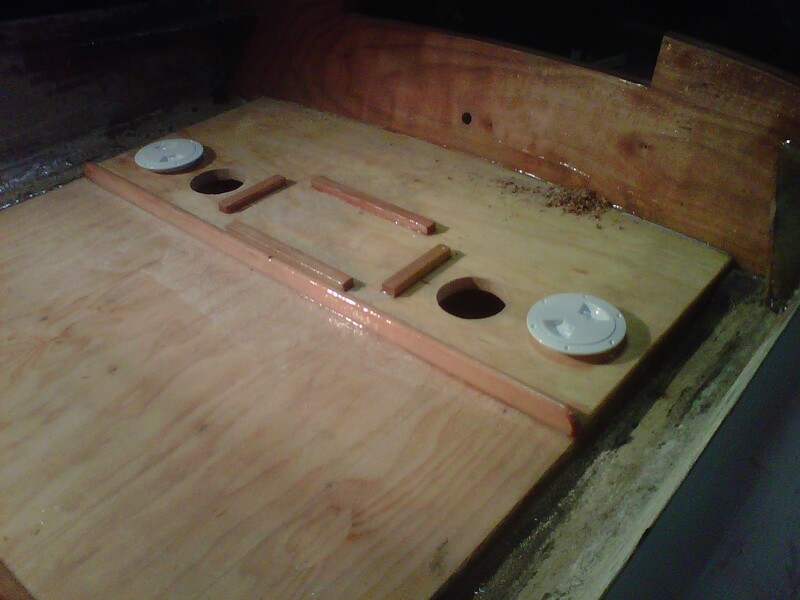 As with SteveK, I replaced the stock transom's four 3/8" plywood layers with five, to make a stronger transom. I also added another layer of 3/4" plywood over the 1/4" plywood floor, just under the splash well area... and fiberglassed that to the transom making a very stiff structure. And I also glassed in corner gussets between the transom and sides of the boat, because I am not very keen on the fact that the G3 deck is not tied to the transom anywhere. There are lots of ways to build additional strength into a G3 transom, this is just what I did, because I wanted to never worry about any motor I might hang off the back. Do you widen the stringers for their aft four feet for less bottom flex underway? Nope, stock dimensions. I should clarify what I said earlier. When I have built boats, I use clear Douglas fir, soaked in thinned poly resin. On my G3 Bandit, my stringers were in fine condition, I did not replace them, but I did go ahead and soak them with thinned poly resin, to seal the wood. Glasspar (in 1959) did not solidly attach the stringers to the fiberglass hull, or the transom. They were just sitting against the bottom of the boat, patched every few foot or so with a square of glass to hold them in place. They were poorly glued to the plywood floor (the flooring pulled right off the stringers). The were not tied to the transom either. Anyway, the stringers on the G3 as built by Glasspar in '59, seemed to be not much more than supports to hold the floor up. Now the floor itself is covered with a good layer of glass and tied to the hull on all edges. This box created by the hull (stringers as spacers) and fiberglassed flooring seems to create the stiffness. Happy to lend my patterns to you, you can transfer them to your own patterns or your boards and send them back to me. OK, when you are ready send them to the address I e-mailed you. Do you think I need to take the deck off to re-do the stringers and cockpit floor? Dean may advise you otherwise, but yes, I am almost positive you are going to have to remove the deck to replace the stringers, floor and transom. I have not seen it done any other way over the last few years. I am wondering if you're done with my stringer templates? I'd like to keep track of them. Dean, do you still have the G3 stringer templates?